Let’s talk bread. You know, this food that constantly gets fingers pointed at? Let’s face it: bread’s getting quite the bad reputation (thanks Taylor Swift for the lyrics). Our friends at BreadBox helped us partly understand why bread has now become the enfant terrible of healthy nutrition. One of the reasons that could explain why people have trouble digesting bread? Bread has changed from its original recipe. A quick tour of your supermarket bread aisle will show you that the breads we are eating today can have as many as 40 ingredients! We’re not messing ‘round, here. But our friends at BreadBox have a clear mission: to make amazing tasting bread with its original recipe: just flour, water, and salt – and make it accessible to everyone. Did we mention it’s organic and vegan?! And to properly highlight their delicious bread, they created savoury recipes that can be devoured throughout the day. Today’s yummy recipe: vegan lox. • Preheat oven to 375. • To slow roast the carrots, place one cup of coarse sea salt into a glass baking dish that has enough room to fit the whole length and width of the carrots. Pat down the salt to form a thin layer. Rinse the unpeeled carrots and place them wet into the salt, making sure that the carrots lay on top of the salt and do not make contact with the glass. Pour about another whole cup or two of salt on top, until the carrots are fully covered in salt. • Place into the oven to roast, uncovered, for an hour and a half. • Once done, tip the baking dish over onto a baking sheet and allow the carrots to cool just enough so that you can handle them. Brush off any salt, then peel away the skin using a knife. Place into a clean glass container. • To marinate the carrots, mix together the olive oil, liquid smoke, coconut vinegar and lemon juice. • Drizzle over the warm carrots and toss well to coat. At this point, the flavor will not taste very “lox like”—they will need to be placed in the refrigerator at least overnight to allow the flavor to deepen and mellow, and for the carrots to get really soft and silky. • If the carrots start to look dry during marinating time, add an additional tablespoon of olive oil and give it a good stir. You want the carrots to look soft and slightly shiny throughout the marinating time. • When ready to serve, remove from the refrigerator and allow the carrots to come to room temperature. • Place cashews in a bowl and cover with cool water. Cover with plastic wrap and set in the refrigerator to soak for 12 hours. Or, if you have a Vitamix you can place the raw cashews directly into your blender, and use the sauce setting which will be powerful enough to make them into a smooth enough texture. • Once soaked, drain cashews thoroughly and add to food processor or blender (or if using Vitamix then your cashews should already be in the blender). Add garlic, garlic powder, lemon juice, water, nutritional yeast, salt and olive oil. • Process until very creamy and smooth, scraping down sides as needed. Then taste and adjust seasonings as needed. • Use a spoon to scoop all the cheese into a glass tupperware. • Place in refrigerator to set overnight. • Spread Vegan Cheese on a slice of toasted BreadBox Sourdough, layer with sliced cucumbers, place Vegan Lox on top of cucumbers, and add fresh sprigs of dill as desired. 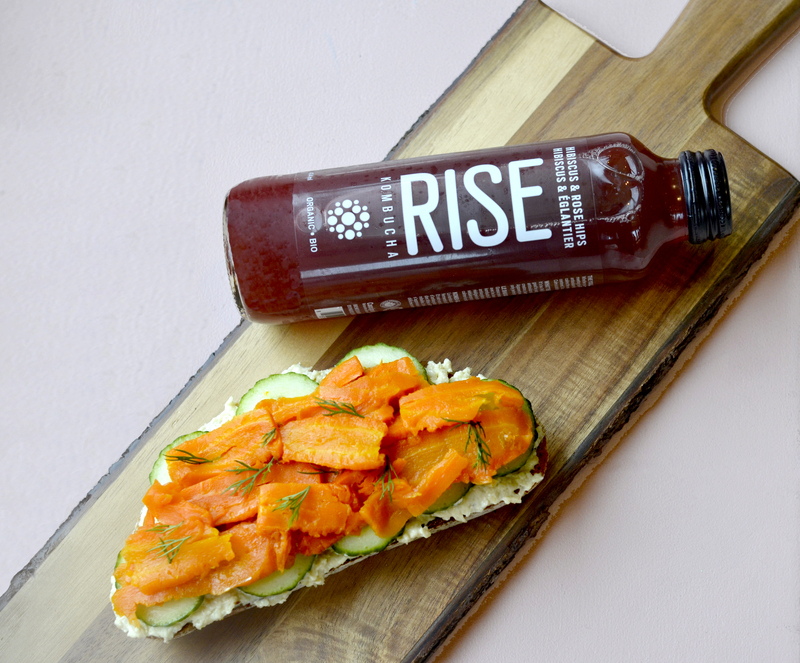 Kickstart your mornings on the right foot with this yummy toast, and complete with a floral and sweet touch: a RISE Hibiscus and Rosehips. Salty and sweet in the same plate: hello, YES. Happy belly on the way.